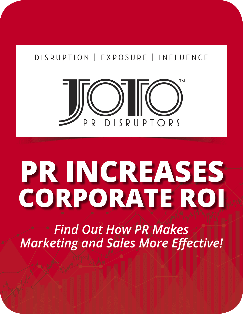 JoTo PR offers disruptive tactics and services to help your company establish third-party credibility in the media, get your message out and set you on your way to game-changing ROI within your industry. From hyper-modern PR techniques, steeped in foundational basics, to social media management, there is more than one way JoTo PR can help get your company to the heights it wants to achieve. Our bread and butter. We exercise results-driven tactics to get businesses into the media and thus building their influence in their markets and becoming Key Opinion Leaders within their industry and to their prospective clientele. Through facts-driven and zero-fluff press releases, highly-respected and targeted placements in media sources and topic-rich interviews with reporters, we will help grow your business into a credibility-machine. Press releases are the lifeblood of any PR campaign. A press release is not a “fluff piece” that beats your chest and tells everyone about your last quarter; it’s about using time-honored media techniques, hard-hitting angles and facts to deliver stories that the media picks up and distributes around the internet superspeedway, thus spreading your influence. Handling a reputational crisis in business is the most precise and artful part of PR that requires special training and attention to fix. Our CEO and team of PR professionals are decade-long veterans in the field of Crisis Management and have seen it all. They know precise communication methods needed to wade the waters of a crisis and pick up the pieces of any mistake and restore the trust back to a business. It’s never easy. Anyone telling you it’s easy to repair a crisis is flat out lying to you. It’s a process and science that cannot be handled without a guide that knows this specialized field. If you require Crisis Management, please call our office immediately (888) 202-4614. Wise people think before they act. Doing anything in business without the up-to-date knowledge of how your target market will react is foolish and will lead to wasting hundreds of thousands to millions on marketing when you’re trying to fit a round peg into a square hole. Our Smart Market Research© is all about finding the key phrases that are common among a certain demographics and putting the puzzles pieces together in your marketing, PR and sales that makes them positively respond to you. Knowledge, as always, is power. The modern business world has a new emphasis on communication with both your internal audiences as well as your external. We have noticed time and time again businesses failing to communicate at the right times, the wrong way and at the wrong intervals. There is an art in how you communicate to different type publics, especially digitally, and if there isn’t a plan in place before-hand, you’re just shooting arrows in the dark not knowing what you might hit. Allow us to help you figure out what your communications plan will be and how it can work with your social media, your PR, your marketing efforts, your sales, and internally—and put it all together in order to get the message across correctly and efficiently for maximum effect. The art of writing is something that is often overlooked. If words are present, a writer’s professional touch should have penned them. While it’s easy to write down the first thing that comes to mind, you want to ensure the right words are used and the proper editing conducted to ensure the message is clear, precise and gripping so that your business stands out among the overused clichés. Our writers use a precise proofing process after copy is written to emphasize the correct verbiage. Our hard-as-nails editor lets nothing slide. That’s not hyperbole as she’s dynamite with a red pen to ensure your copywriting gets the message understood and causes action! Social media is the digital fabric of the lives we lead today. Ignore it at your own peril. You know what it is, but do you know how to use it? Not every person who Tweets is a Tweeter and not every person who can create a Linkedin profile knows how to promote company growth with it. Social media is a technology as well as a language that needs to be mastered for any dent to be made in the information super-speedway. Our social media team can dedicate the time into cultivating posts, increasing engagement and finding ways to get your leverage your publicity and brand into each post on your social media platforms. The JoTo PR standard is one of no smoke and mirrors and an unswerving insistence that we get results. When you’ve successfully managed crises, you have a level of precision and tenacity that overcomes anything that’s naive enough to get in our way. In short, we don’t accept reasons why results cannot be attained for your PR campaign, or any part thereof.